Ralph Vaughan Williams was the son of Margaret Wedgwood of Leith Hill Place and Arthur Vaughan Williams of Tanhurst. His grandmother was Caroline Wedgwood nee Darwin. When his father died, Ralph’s mother returned to her family at Leith Hill Place. Growing up in his grandmother’s house the young Ralph was encouraged in his first compositions by his aunt, Sophy Wedgwood . 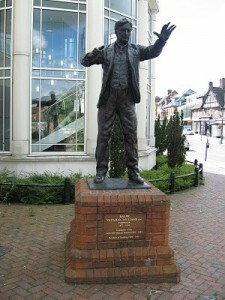 After some time in London the composer returned to the area in 1928. From 1933 to 1953 he lived at the White Gates just off the Westcott road. He played a large part in the life of the town. 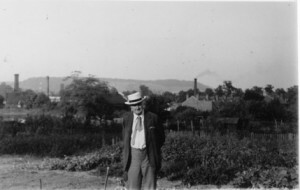 He was a prime mover in the Dorking and District Refugee Committee, and provided the music for the Abinger Pageant to raise funds for Abinger church. (EM Forster wrote the text.) He tried out ideas for his 5th symphony in another pageant, written for the Dorking & Leith Hill Preservation Society. All his life he worked for egalitarian ideals and with the Leith Hill Musical Competitions he fostered musical participation of the highest quality for the whole community, rich and poor. With neighbour Lucy Broadwood, Vaughan Williams was in the vanguard of efforts to preserve folk traditions. He recorded local gamekeepers and labourers, motivated by the chance of ‘picking up some rare old ballad or an exquisitely beautiful melody, worthy, within its smaller compass, of a place beside the finest compositions of the greatest composers’. Themes from the traditional songs from all over the country (including Surrey) found their way into his own compositions. Ralph Vaughan Williams is one of the best loved composers. His ‘Lark Ascending’ (1920), suggested by a poem by George Meredith of nearby Box Hill, is frequently voted Britain’s favourite piece of classical music.